I find the packaging, whilst having no bearing on taste, important for the portrayed story of the whisky, much like the cover of a book (for more details why, see here). Here we have the classic Johnny Walker square bottle, cork sealed, seemingly more refined than the Black Label. The box is a metallic green and presents the single malts used on the back with their key flavours. On first whiff I note a peculiar blend of seaweed/salty air and a certain sweet-richness. This seems to indicate a level of complexity that I will probably not be able to give justice too and could be indicative of its blended pedigree. I recently heard someone say that they had tasted a blend so well balanced that they actually had difficulty identifying flavours. The sign of a good blend must surely be the balancing of many complex flavours. On tasting you immediately get the iodine pepperiness associated with Talisker. The whisky sweetens through the mouth to sandlewood, before finishing with a very slight oak flavour. There maybe some burnt butter in there as well, which could be the Caol Ila peat-sweetness. This is definitively not a beginners whisky, furthermore I feel its a 'quiet moment' whisky...something to dwell upon, a mystery woman with mysterious ways...so I try to get to know her slowly. I really enjoy the saltiness of the Green Label, but I struggle with the strong Caol Ila sweetness (I am not generally a fan of the Caol Ila malt). I keep finding my opinion changing on this whisky...does this have more to do with my uncommitted and indecisive nature? 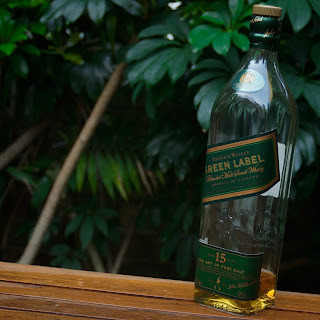 Notwithstanding this, it must be noted my post regarding 'mood & whisky' was prompted by the Green Label's multiple personality...a sweet lady one night and bitterly twisted the next. In the latter circumstances I recommend reducing the tasting to wee-small sips. A drop on the tongue, let the flavour unfurl without the threat of oral explosion occasionally induced with larger mouthfuls. Anyway, enough of the vagaries. The alcoholic volume sits at 43%, but it feels more than that. The mouth feel is quite alcoholic and very rich in brine-saltiness. If I was looking for a food companion, I would choose some game, maybe venison. Could also be a haggis whisky (not that I have ever had it), perhaps followed with a soft smelly cheese. My internal dram-ometer points the needle towards 5.25 lightning bolts (from a possible 7). But I always think the question is: would I buy it again? Answer: Possibly. I would because it is the only pure malt I have had, with the exception of a small dram of Blue Label (sometime ago). But the Green Label hasn't been a 'go to' whisky for me. In fact I have drunk the whole bottle myself trying to write this review, my first review. If I did buy one I am sure my opinion would keep changing, no matter how many times I have it. * pure or vatted malts can be (1) blended and bottled almost immediately; or (2) blended and further aged (or 'married') once in the cask. I am unsure if Johnny Walker chooses to marry its Green Label (or the Blue Label for that matter).